From left, county Health Commissioner Gabe Jones, Highway Patrol Trooper Brian Allen and Mechanicsburg Police Chief John Alexander operate the simulated operations center during the June 6 hazmat drill. The Champaign County Local Emergency Planning Committee (LEPC) and the county Health District held a joint emergency disaster drill June 6 in the county Community Center auditorium. “The purpose of the joint scenario is to test how the county would deal with multiple disasters if they were to happen simultaneously,” explained Jim Freeman, director of the county Emergency Management Agency. The LEPC drill was a “functional” exercise, meaning that the functions and communication among organizations were tested in a drill that simulates managing a full-scale disaster without going into the field. The LEPC is required to hold four exercises within a four-year period, including one full-scale drill with first responders in uniform and with gear at a chosen site in the community. The functional drill started with a fabricated outbreak of tularemia caused by bio-terrorism. An individual with the disease crashed his anhydrous ammonia tanker. The Health District and local medical agencies had to manage an influx of tularemia patients into their facilities. CRSI, Mercy Memorial Hospital, Springfield Regional Medical Center and Vancrest of Urbana were all involved in solving the problems presented by the scenario. The drill tasked the EMA to set up an Emergency Operations Center and evacuate people from areas affected by the harmful vapor leak. The EMA, Mechanicsburg police, Ohio State Highway Patrol, Red Cross and fire departments from Pleasant Township and North Lewisburg contributed to resolving the scenario. Some players interacted with both sides of the scenario, managing their time between the LEPC drill and the Health District drill. Health Commissioner Gabe Jones, one of those players, mentioned that the joint drill was valuable because he had learned where best he was needed at different times during disasters. At the end of the LEPC drill, evaluators commented that the players of the scenario communicated well with each other. They indicated they expected the county would receive positive evaluations. “We saved everyone. That’s the important part,” said David Torsell, Urbana Fire Division inspector. The Health District will be coordinating with FEMA for POD, Point Of Dispensing, training. The focus will be on how to dispense medicine in emergency situations. 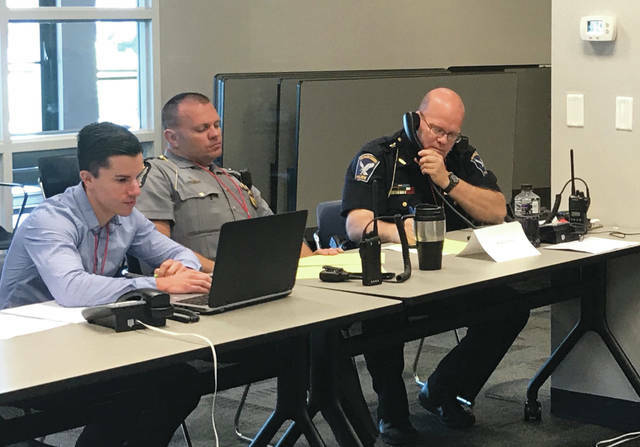 https://www.urbanacitizen.com/wp-content/uploads/sites/36/2017/06/web1_LEPC.jpgFrom left, county Health Commissioner Gabe Jones, Highway Patrol Trooper Brian Allen and Mechanicsburg Police Chief John Alexander operate the simulated operations center during the June 6 hazmat drill.